Scrap It With a Song: It's rainin' winners around here!! It's rainin' winners around here!! Sorry for the late post guys. I went on vacation expecting to be home in plenty of time to get this all posted and that did NOT happen! Unfortunately for all the plans I had set, it seems everytime I take a road trip something goes haywire....maybe I should stick with planes! LOL! If you are waiting to hear from me via email about something...that's why you haven't as well and I'm catching up on that next. The current week's challenge will be posted later tonight, but I wanted to announce the winners before I got too far in catching up here at home. Also, as a side note....the link app was having issues Sunday. So all entries that were left in the comments regardless of the time it was posted were in included in the draw. Such a sweet way to incorporate those lyrics! 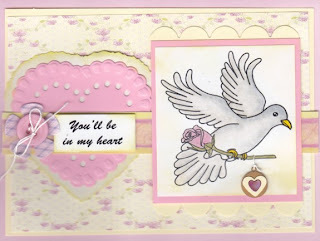 Such a lovely card with such a sweet color palette. This layout knocked our socks off...so beautiful! I love how you took the line about an unbreakable bond and applied it to a sisters layout! What a great take on the challenge, loved the line you chose! Congrats to all of our winners and runner ups on this challenge AND on the blog hop. As for that blog hop, remember to collect your goodies from the various DT you will need to visit their blog to see details on how to contact them and to verify that you are in deed the winner. To make it easier though, here is a list of our blog hop winners. I will update it as the DT post their picks. Thank you very much for choosing my lo! Congrats to the other top 5! Great work, ladies! Thank you so much and congrats to all the winners! It was a fun hop and congrats to all of the other winners! And Christina, thoughts and prayers are being sent your way... I hope you daughter is feeling better!!! That's just tooo scary!!! We'd love to be able to promote your site, work or store. Your logo and link will be permanently displayed in our sidebar and in our sponsor page. Makers of digital product are welcome too!